COURSE CASE MAPS are case products (Case Studies, Caselets, Case Flyers, Case Briefs, Case Spots, Must-Read Articles and Books, Movies) being mapped for a course. Mapped for the best and most-often-cited textbooks, these course case maps enable a holistic learning by unraveling the business dilemmas embedded in the concepts. This Course Case Map offers a rich collection (List) of ET Cases' case studies that are mapped for a popular text book "CONSUMER BEHAVIOR" by Leon G Schiffman, Leslie Lazar Kanuk, and S Ramesh Kumar. This Course Case Map offers a rich collection (List) of ET Cases' case studies that are mapped for a popular text book "Marketing Management" by Philip Kotler, et al. 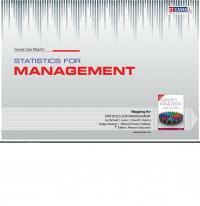 This Course Case Map offers a rich collection (List) of ET Cases' case studies that are mapped for a popular text book "Statistics for Management" by Richard I. Levin, et al.